finally, after switching between r8 collets for endmills and the r8-shanked drill chuck and having 2"+ reduced in the z-axis from the chuck itself, it was time to simplify things. the benefits of the larger ranged er collets (32, 40) is that they have approx. 0.040" flex range so you can easily chuck drill bits, endmills and whatever else round shanked cutting tool in there. the er32 set purchased from enco (accupro brand) has a range between .078"-.787". below are some pictures. again, after doing web searches for "er spring collets", "er collets", "er32", etc... it was difficult to find information about these. 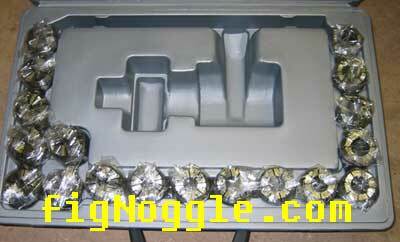 even manufacturers' websites had little basic info on this type of tooling. 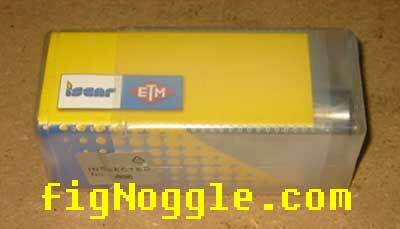 here's the box from enco - it's an 18-piece er32 set of accupro brand collets. it was in their hotdeals catalog for $230 which is ~$12.77/collet. pretty good deal. these were made in taiwan. 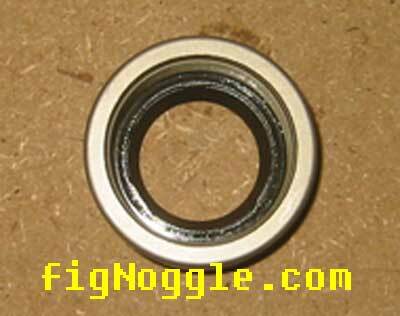 these brands have collet chucks and spring collets. there are different types of collets from the "traditional" r8 to different types of spring collets (single angle, double angle, etc..). there are different er sizes that basically determined by their gripping range. for example, with er32, the full range is between .078"-.787". while a smaller er16 ranges from .020"-.393". a complete write-up will be posted sometime in the near future. this was truly a confusing start. 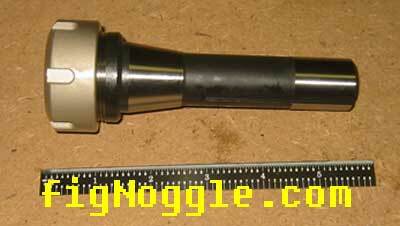 this is a r8 shanked collet holder. unfortunately, enco (this one is model #dr-204-5005 from their hotdeals catalog) doesn't sell r8 er32 collet chucks. this one was returned as it only works with full-grip spring collets. not er type collets. enco was great about the return. i called them, spoke with a tech and sales rep, and minutes later, a RMA number was issued and the collet was returned same day. 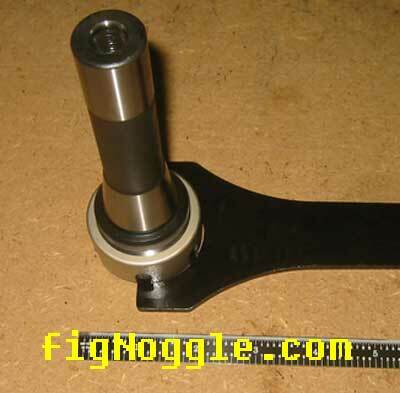 mscdirect, travers, j&l, kbctools all sell various forms of collet chucks, but j&l had the best price listed on their website. 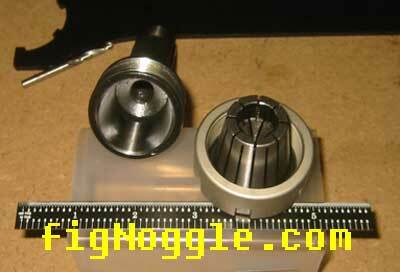 j&l also sold import models of the r8 er32 collet chuck for under $80. good deal but they were out. the next price level up was the etm brand and bison brands. mscdirect was pricier at $165 for just the chuck. you still need a special spanner wrench and theirs was $20. so a call to j&l and the sales guy basically was great about pitching me the right products - not too pushy (i even tried to see if they would import a super x3 mill from sieg!). they didn't have the import model in stock (would arrive in july) but he sold me the etm for $109! sounded good. added a $10 spanner wrench and was good to go. apparently, etm is an israel-made product. i was concerned about losing upwards of 2" of z-axis travel due to the nut, but this was not the case. here's s #10 machine screw drill bit mounted. i no longer need to use the drill chuck! here's an interesting note. see the diamond-shaped engraving on the top of the inner shiny circle? not sure if this was done on purpose, but this is where you insert and eject the collet. this picture shows the inside. there's a retaining clip with two ears at the bottom. you start clipping in the collet here and push down at the top to seat the collet. ejection is the reverse. here's an inside view of the r8 er32 with the spring collet inserted. it wasn't cheap, but it was cheaper than any set you can buy out there. many of the sets do not come with a full range of collets. for example, at msc, you can buy their etm brand set and it comes with the r8 chuck, spanner wrench, case, and only 11 collets for a whopping $495! if you were to add the remaining collets to make a full set (at $13/collet) the total would come to $495 + [(18-11)*13] = $586. so by buying bits and pieces, you can save $236! the advantage of using these is that between bit changes from endmills and other cutters to drill bits, you no longer need to swap out the r8 collet each time. 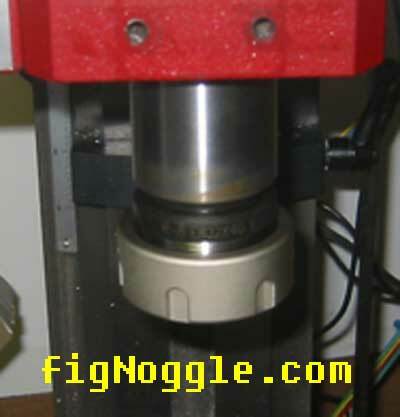 plus, the additional z-axis travel you get by not using a drill chuck is nice. 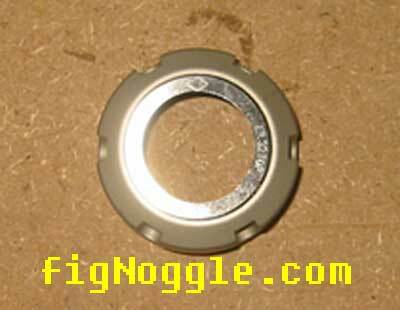 the only disadvantage is that you have to unscrew the nut off the chuck each time, but may end up still saving tooling change times. collets from different ranges are NOT interchangable.